Watermelon and summer go hand in hand. 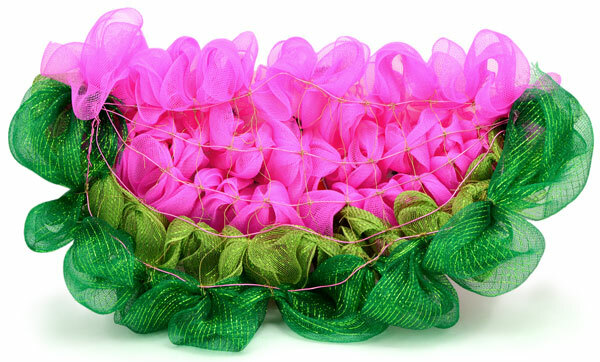 To celebrate the arrival of summer, we've created a great Deco Mesh Watermelon that is far from your traditional wreath. Its a perfect summer decoration for doors, porches, or for your next backyard BBQ. 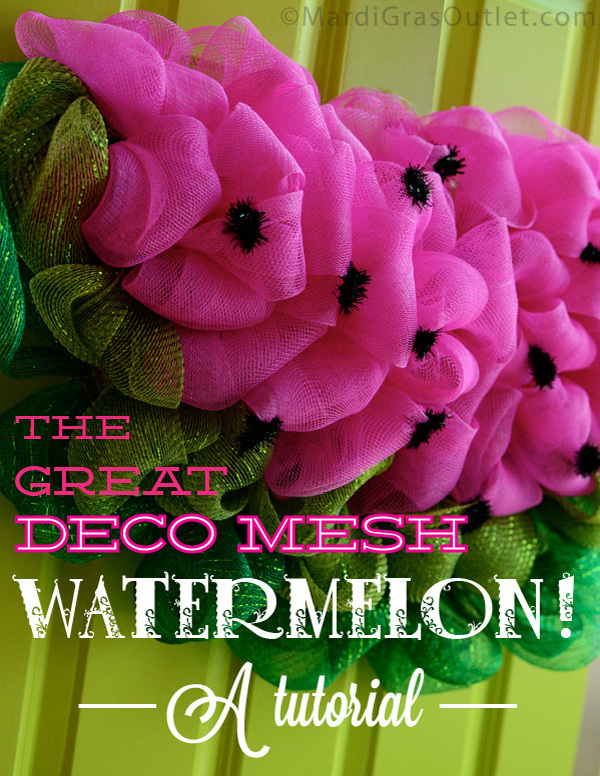 The Great Deco Mesh Watermelon tutorial gives step by step directions for this DIY project including how to make your own custom shape wreath form! Keep reading for all the details. 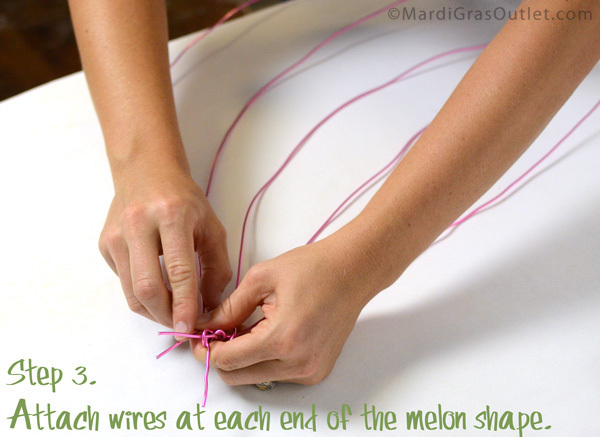 The size of the watermelon is easily controlled by the wire frame that you will make. Customize it to your space by making the frame larger or smaller. Our custom form is approximately 12" tall by 22' wide. The Deco Poly Mesh used to fill the form will extend beyond the wire form, making the final watermelon large- 18" tall by 30" wide. 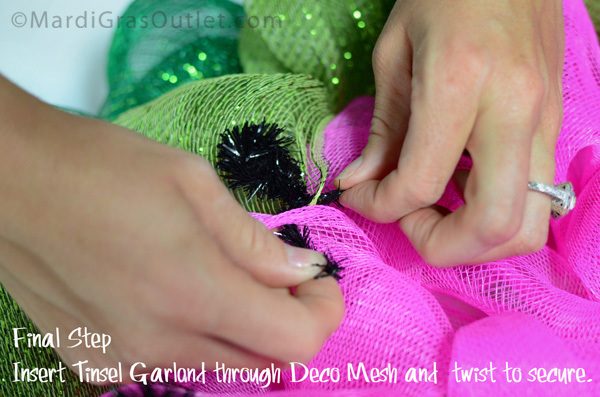 Time/Cost: The Deco Mesh Watermelon "wreath" takes an afternoon of crafting to complete. 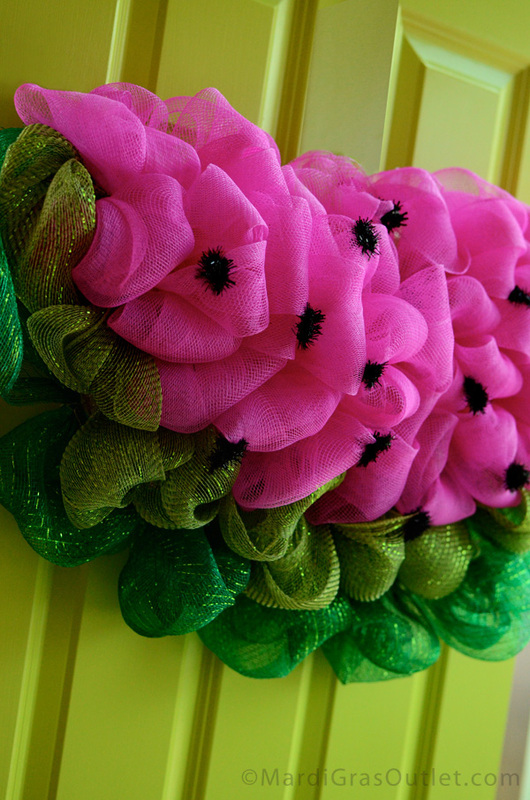 This wreath is more time consuming than other projects because you have to craft the form as well as the wreath. The cost of this project is approximately $30 with product left over. (click HERE for pricing information). Cut a piece of aluminum craft wire that is about 55" total. We used 2MM, Hot Pink Aluminum Wire. 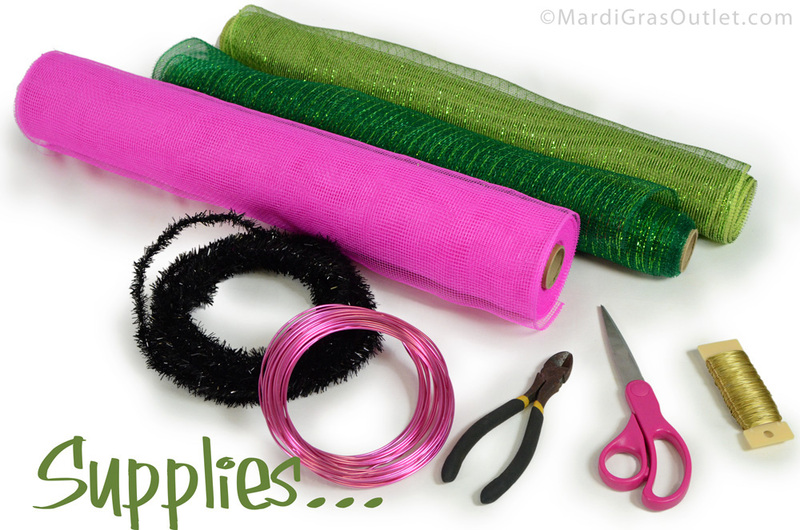 Use your wire cutters to cut three wire pieces about 30" long, allowing extra length to twist them together. These pieces create the braces of your form that the deco mesh will attach to. Layer in the three pieces of wire- lengthwise across this form. Attach by twisting at both ends. We used lighter weight 24 gauge paddle wire to make vertical braces. These braces provide structure for the form. More cross braces will make more, tighter puff sizes and less braces will make fewer, looser puffs. For our large watermelon, we ended up using 10 braces for our large watermelon. You will need less if you make it smaller. Starting at the top of the form, add the braces vertically between the wire. 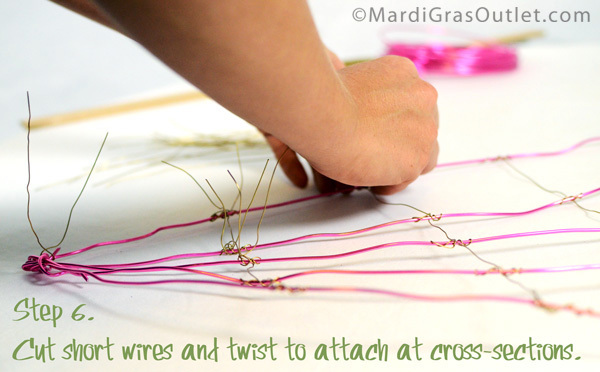 Where the wires meet-twist them tightly and make sure they are evenly spaced to add strength! At each cross section you will need a 5" wire tie down for the deco mesh. 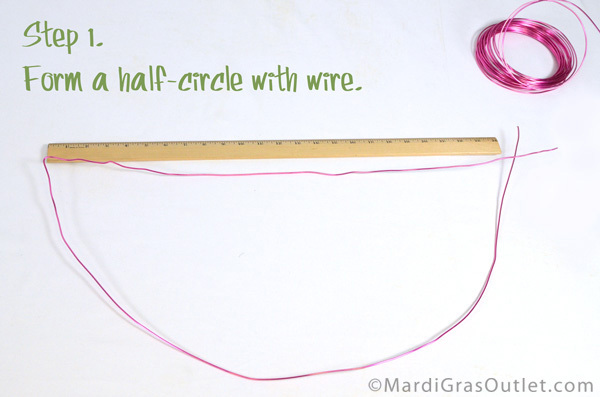 Cut 5" lengths of wire (as many as your form will need).Twist this wire onto the form where the wires intersect. You want each pair of ties even in length. Be careful, at this stage there are many poky wires. 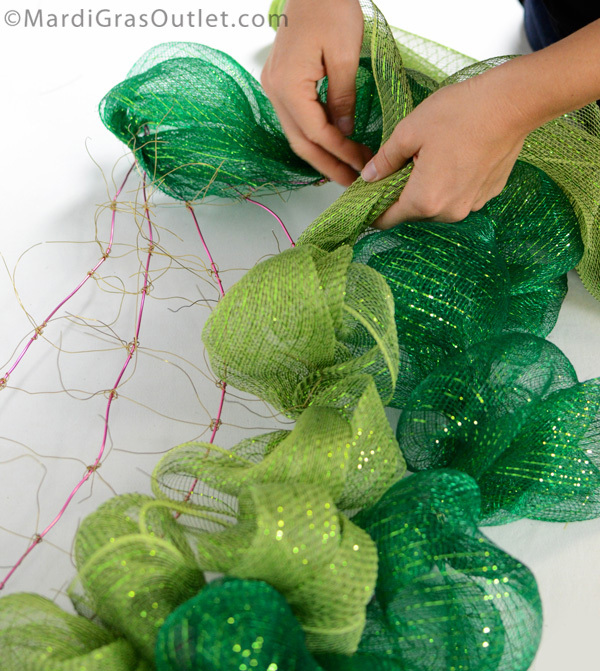 Start on one end with the emerald green mesh. Fold the emerald green mesh over into one end of the watermelon in order to hide the frayed end. Continue across bottom line of the form. At each wire tie section, gather the mesh into a puff and attach to the form. Continue down the entire bottom row of the half circle forming puffs and twisting into wire ties to attach at cross brace. Move up one row using the apple-moss deco mesh for the second row. You can use the same wire attachments as you used for the emerald green, or simply attach an additional wire to the corner. Tuck the frayed ends in as before. The mesh should always begin and end at the corners to ensure fullness! After the two rows of green mesh, there are three rows of pink mesh. After each row continue back around onto the next row without cutting. Trim excess mesh when finished and tuck the final pink puff into itself to hide frayed edges. The back of the completed watermelon-showing the custom made work form. 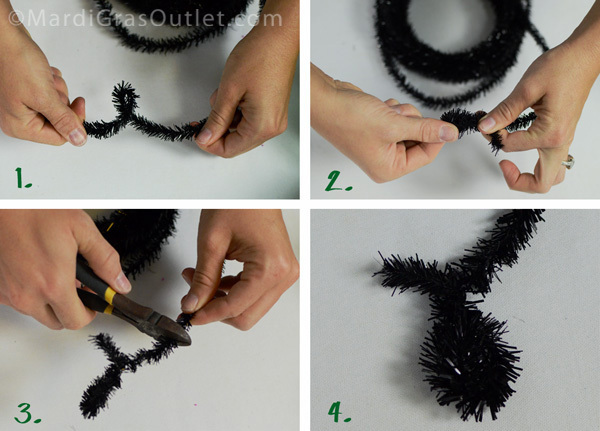 Form tear-drop shapes with black metallic Tinsel Roping (approximately 8" pieces), leaving extra length on the end to attach into the Deco-Mesh. Use the wire tails of the seeds to poke through the mesh, twist the tails together, and bend the seed over itself to hide the twists. 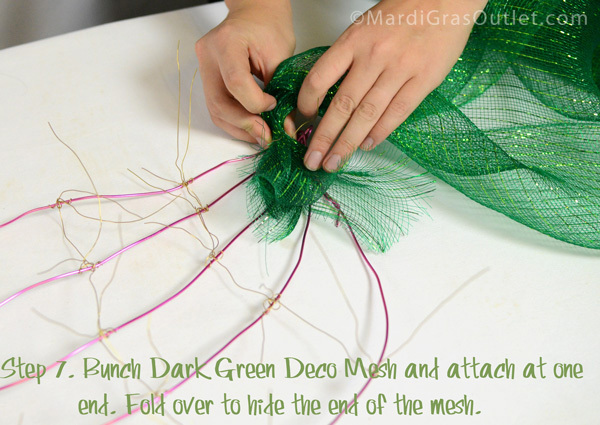 Hang your finished Deco Mesh Watermelon! Time to slice into some sweet, refreshing watermelon and celebrate the arrival of summer We hope you enjoy this fun Watermelon Decoration tutorial! I love watermelon this is my best ever summer item to make. Can't wait to make this!! Just beautiful!